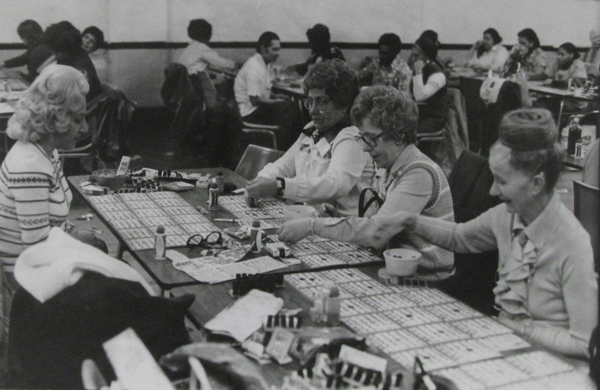 Of all games spanning the globe, the history of bingo is one of the most fascinating tales of origins among them. It all started nearly a century ago with a young entrepreneur from New York and a traveling carnival many miles to the south. In 1929, toy manufacturer Edwin S. Lowe was traveling the country in search of new ideas and fresh marketing designs. While making his way across Georgia, he came upon a traveling carnival just outside of Atlanta. He decided to stop in and see what was going on. It was a rather large carnival, with numerous open games and tents lining the midway. But Edwin Lowe found himself drawn to the largest tent of them all. Before he got very close, he could already hear the raucous crowd noise from within the tent, drawing him ever more eagerly into the tent. Once inside, he was fascinated by what he observed. The people within were seated at rows of tables playing a game called ‘Beano’. They were incredibly enthused with the game. At the front of the tent was a man drawing random numbers from a box. Each number was called out loudly for all the spectators to hear. The players would then search their bingo cards for the called number. If the number appeared on their card, it was covered with a dry bean. This is, of course, where the game of bingo got its original name, ‘Beano’. Each time a player covered a complete line of numbers on their 5×5 card, running straight up and down, across or diagonally, they were awarded a prize and a new game of Beano began. The game went on in this fashion well into the wee hours of the night. Edwin Lowe was shocked at the discontented reaction of the crowd when the head man called the game over, having to demand that everyone go home. After a bit of arguing and beseeching, the people dispersed and the tent cleared out. Utterly convinced that his search had come to an end, Lowe traveled immediately back to New York to begin working on the game. He fashioned a series of 5×5 bingo cards from cardboard, set up a box from which to draw numbers of 1 through 75. A bag of dry beans was divvied up. With the stage set, Edwin Lowe began inviting all of his closest friends to come over and try out his new game. Just as Lowe suspected, the game of Beano was intensely relished by his friends. The history of bingo took two major turns that night. First, Edwin decided he would immediately begin production of the game to offer bingo to the nation, and second, the name was changed from Beano to Bingo. Everyone loved it, and the game of bingo was born. The next step was development. Edwin Lowe contacted a professor at the University of Columbia by the name of Carl Leffler. He contracted Professor Leffler to design 6,000 unique and random bingo cards. Each was to contain 25 numbers on a 5×5 grid, with each column containing 5 numbers from a 15-number group; a total of 75 eligible numbers in all. Carl Leffler got straight to work and completed the designated task, but it is believed that the professor went insane shortly afterwards. Edwin put the game of Bingo into production and marketed it as Lowe’s Bingo. It was an instant success, with thousands of copies selling across the United States in record time. By 1940, another twist in the history of bingo came about. A pastor in Pennsylvania was looking to raise money to build a new church for his congregation. He was currently conducting his sermons from a rundown shack of an old building. Having enjoyed the game of Bingo himself, he thought it would be a grand way to entertain his congregation while raising the necessary funds. It was so successful that they were able to build a grand church, and charity bingo has remained the number one source of raising fund across all of North America ever since. Bingo is even a favorite way for children to become more educated. School’s have been using bingo to teach math, science, history and other subjects for decades, first started by a German teacher who felt that a combination of education and entertainment would produce better results – and he was right! Bingo hit an all-time record high fan base in the mid 1990’s when it was introduced over the internet. Online bingo fans from all around the world now gather at one of hundreds of online bingo halls, offering the traditional game of 75-Ball Ball Bingo, as well as the UK favorite 90-Ball Bingo. The history of bingo has certainly evolved over the decades, and is even available in its newest form of 80-Ball Bingo. Many describe this version as being designed for those who think 75 numbers just isn’t enough, but 90 is too many. In reality, it’s just a new way to play bingo on a 4x grid, rather than the North American 5×5 game, or the European 3×9 grid. And thus the history of bingo continues to evolve now, and will certainly have much more to tell as the years go by.